Snowy drive on the Greensprings Highway in 1928. This is my mother's family Daugherty on a trip from Ashland to Klamath Falls, Oregon. 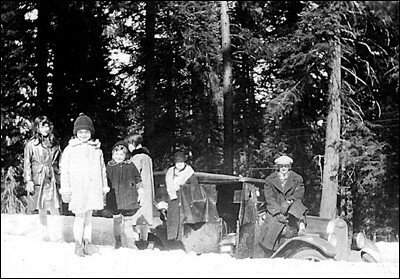 My grandfather Fred is sitting on the hood wearing his driving goggles, my grandmother Maude standing to his right. The girls are my mother Fredene and her three sisters, Carol, Betty and Leona.